Surfah - here are some thoughts regarding your comments. 1. Having driven three Vantages (two as loaners, if that says anything like why do I keep needing service loaners), I think it qualifies as a sports car with some reservations - with one of the upscale leather interiors including detailing on the headliner, it feels more GT; although it feels responsive, it could use 20-50 more HP and drop a few pounds although at 3,650 lb it's not too different from the AMG GT cars. Car & Driver recently tested the Vantage (#3), a GT C Coupe (#2) and a 911 GT3 (#1) - which is reasonable. I see #3 as a sports car leaning toward GT; #2 is a sports car approaching track car like the 911 GTS, and #1 is track-oriented but, in my case, a terrific daily driver. 2. Here are some details for a lease agreement on a $160K Vantage ($1,248/mo, 36 months) [color=left=#222222]Security deposit waived. Total due at signing of $5,000 which includes first payment, licensing cost, registration fees and taxes (based on Orange County, CA rates). Lessee must present dealer with a current lease statement for the lease of another vehicle with at least $7,500 in monthly lease payments remaining. Lease includes 7,500 total miles, excess miles at $1.00 per mile. Residency restrictions apply. 4. My mentioning the 992 Carrera 2S is in regard to my personal shopping list. With the GT3 on one side of the garage, it would make sense to pair it with a more daily driver-oriented sports car, hence the Carrera 2S or GT C. When I had my '16 GT S and a '15 911 Turbo S it was one of the few times I could drive one car and not wish I was in the other - both had individual aspects of performance and excitement. The non-GT3 car will have to be auto for my wife's sake, and even though I love stick-shifting, heel/towing, etc., I'm loving PDK as well and shifting up/down a lot more. Also, I can't afford to undermine my wife's support for big car payments. 5. I saw the new 911s at the LA auto show. I agree. I'm not wild about the rear end bulge but I'm OK with the light bar and 3D letters. Also, my initial impression was that the rear wheels (larger than the fronts) are too big. But I can be sold on Porsche performance, value (cf. Vantage) and build quality. The new 2S is almost as fast as my GT3! Early road tests are indicating that Porsche didn't mess it up. Lucky for us, these and others are all good cars and we have an opportunity to test drive and own whatever appeals to us at that moment. Drive On! Never drove a Vantage so I will defer to your opinion. We both own GT3's so come from a common frame of reference. Thanks for the details we were all waiting for. I know RR and Bentley do these 2500/year type leases to attract new buyers, guess AM is following suit. Drove the ZF with Quickshift in a Continental GT, lazy is a good description. How about the 911T (not touring)? Wife needs PDK? Thanks, Surfah. I, too, am trying to get back to an AMG/911 garage. Wish my dealer was not so greedy - they're turning down $100K plus buyers' premiums above MSRP on the GT R PRO! I'm thinking a GT C coupe would be a good sweet spot for me and I'll see what happens when the 2020 order banks open. Yes, my wife (whose Mom and sisters can drive stick) likes automatic. She's worried about stalling and when I taught her 20 years ago on a 996 911, she did OK but it was before "hill hold" and she pictured herself coasting into the car behind her. You're right, a 991T would be a good alternative as the other car to the GT3 if PDK weren't needed. BTW, Chris Harris (Top Gear) and "Mr. JWW" have done good videos of the new 911. Cheers! Vantage's nose reminds me of a fish with it's mouth open. The front end reminds me of a fish that's pulled off the hook but in so doing so also pulled out its lower jaw. I find it very unsettling. Lol. I remember once reading a reference to the front of the GTR (ghm) and how it reminded them of an angry Pokemon. I thought that was funny. Another good one was when a blogger described the color as looking like a: "crushed grasshopper metallic." If you don't mind me asking. How far did you go and did you drive the car home or have it shipped? I flew from Kansas City to Columbus, OH. When I purchased the car I was reimbursed for my airfare. The dealership also shipped the GT R to me free and took my Z06/7 back free. That's super. Sounds like they did everything except some yard-work when they did the delivery/pick up - lol. and they will most probably fix it with a new fascia or some trim next year. ok so what’s the MF and residual? Curious you didn’t include those details. At least I got back some numbers. The math seems inconsistent but designed to create marketable monthly figures. They are offsetting a higher residual with a higher MF on the 2 year lease. Something I haven't seen before but all rates are quite aggressive. 7500 total miles or per year??? It’s a shell game, they have you looking at the rate and not the huge principal. if it’s 7500/3 years than they are asking you to pay for almost half the car for three years stored in your nice indoor garage IMO. Last edited by AMG 17GT; 02-09-2019 at 03:54 PM. But as before, I don't get some of your comments. Shell game? A lease like a purchase is a very straight forward scenario. Each one has benefits/disadvantages. We lease because we don't keep cars longer than 2 years or so. We also put typically 7500-10000 miles on a car so this fits right in. At a glance, leasing a Mercedes, AMG or not has inferior rates. There are other factors to consider of course (the actual deal of the car, overage per mile costs etc.) but in general it looks decent. I mean the rate is so low it kinda of takes your eyes off the major depreciation. But your right, we know what it all means and you can throw the keys back after 2 or 3 years. We are in the market for a new roadster and thinking AMG GTC. Love the coupe but need a top-down car. Timing-wise it'll be a MY19 or 20. 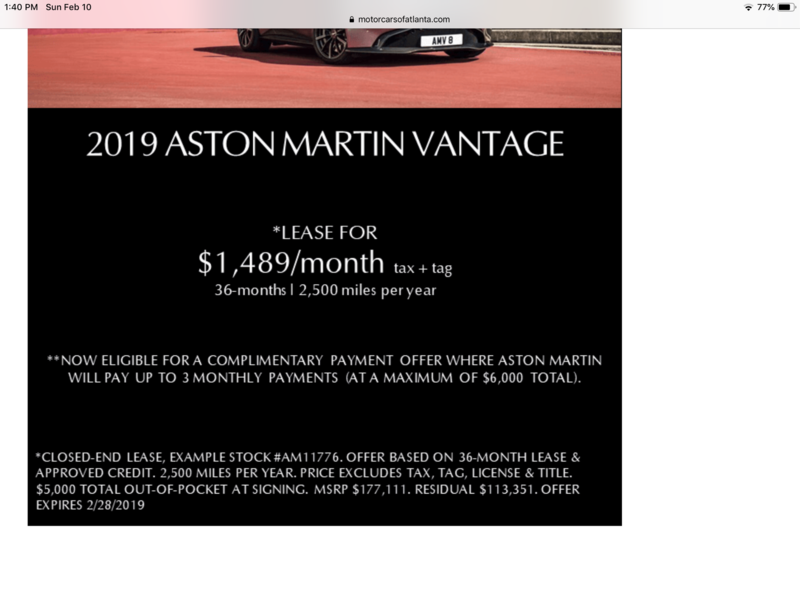 At the same time I am being teased with very low-priced lease deals on 2019 AM Vantages and wonder if it's worth as an additional weekend car. While I agree that the cars front grill looks a bit more unfinished than previous models, the car looks incredible in the flesh with its small overhangs. Interior is quite nice, has the AMG 4.0 liter engine, MB electronics and with an average price of $180k is hundreds less a month than a bare-bone AMG GT coupe. Only way I would consider owning an AM or any exotic brand for that matter. Is if I lived in close proximity to a dealer - not saying you don't. AM doesn't have a large dealer network. Another factor in considering a long road trip. I'm in no way saying it's not a good car. Things break on all cars. Before we got an MB dealer where I live. Closest one was 120 miles away. Wasn't fun when my SL63 had to get towed there when the ABC went out. Not to mention - maintenance. I only wanted the dealer to do it. So I had to plan in advance to drive down there and hang out. Basically, it was an entire day to accomplish that when all was said and done. So true. We live in Minneapolis and the closest McLaren/Ferrari dealers are in Chicago, some 400+ miles away. I won't get either for that simple reason. Aston Martin dealer is within 2 miles from our MB dealer and the car now features a fair amount of MB components and the same 4.0l M177 engine that is in many AMG models (albeit with different specs). So the engine could be serviced by MB during a road trip. Understood. That's the only reason I am even looking at this. A lease like this is a hedge against depreciation. My assumption is that the real depreciation will be over 50% in 2 years. Yet the lease locks it in at 33%. These leases are designed to move some metal. Yup. Thats the idiotic 7500 mile total lease that has been mentioned by some in this thread but I guess I can see some uses for a cheap ultra-low mileage lease. That's crazy. Lease equates to 48 miles per week. For some, that's a dinner/movie night out and a trip to the grocery store. Not worth it to me. $7.22 a mile, not including tax and license (or insurance) but taking into account the 3 "free" months. Very pricey. Please recognize that the lease I am referring to is a 22500 mile lease (7500 a year). Something that can be compared directly to a Mercedes lease. The 2500 miles one is idiotic but identical to countless leases available for Rolls Royce, Bentley, McLaren, etc. As with Wolfman, our A-M dealer here in SoCal (Orange Co) is less than 2 miles away but when my wife and I thought about moving to her hometown in Rochester, NY to be close to our families, we found that the nearest A-M dealer was in Toronto, NYC or CT. As I approach the end of our DB11 lease, the Vantage lease opportunities look attractive but I'd want to know the 5K or 7.5K/mi figure to be sure. That said, most inventory cars are priced comparably to a well-equipped (loaded?) GT C or GT R. I've driven three Vantages, two as loaners. Performance is very good perhaps with more torque than I had in my '16 Ed1 GT S, ex-Lotus engineering head, Matt Becker, has done an excellent job with handling, the ZF 8-speed is programmed well especially in Track Mode (more aggressive than the DB11), the sound is comparable or GT cars in Sport+/Race, interiors go from sinister, all-black Alcantara to high-style leather trims and, particularly in certain colors, the exterior styling looks good. It's a good point that engine issues could be addressed by a Mercedes dealer but what I've seen on the DB11 are issues with switches: trunk lid, center console and driver's window (like driving on the freeway holding onto the "up" switch so he window won't drop two inches in a rainstorm, except when I change lanes and need to use the turn signal and the window drops). A buddy of mine has a YouTube channel - Auto Focus (there's more than one with that name). If you want to see and hear a couple of these cars, you can search "Auto Focus Vantage" (or enter GT3 instead to see our video of that car). I'm hoping to borrow an AMG GT S/C/or R so we can shoot a video on his channel. Personally, I keep being drawn back toward an AMG GT C or GT R because we owned an AMG GT S and liked it a lot plus the Performance Driving Academy experience at Laguna Seca was incredible! I would assume these leases are for dealer stock only? To help move them. 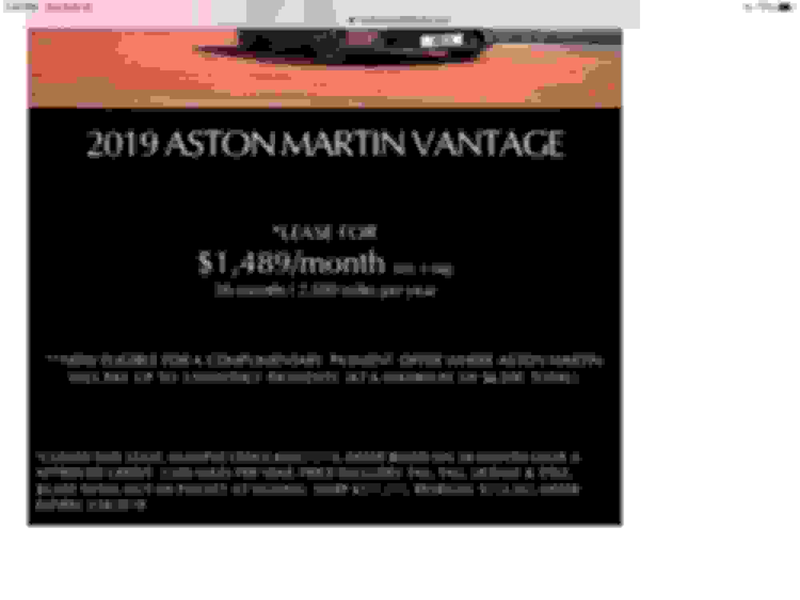 The Newport Beach, CA dealer has 11 Vantages (up from 5 recently) each advertised with specific lease details (based on MSRP) otherwise same terms and for a specific VIN, so appears to be inventory-only to move units.